Now that we have WINCACHE 1.1 Beta released which has got implementation for both user and session cache, one can easily take advantage of WINCACHE user cache and increase performance of Joomla. In this post I am going to tell you steps to use WINCACHE user cache with Joomla. Joomla caching code is modular and in order to enable WINCACHE user cache, one needs to paste the below code in a file named wincache.php and place it at folder libraries\joomla\cache\storage. All the folders mentioned here is with respect to root folder of Joomla installation. * Clean cache for a group given a mode. * Test to see if the cache storage is available. * @return boolean  True on success, false otherwise. * Set expire time on each call since memcache sets it on cache creation. * @param string  $key   Cache key to expire. * @param integer $lifetime  Lifetime of the data in seconds. I am also attaching the file named ‘wincache.php’ in zipped format which can be unzipped and wincache.php can be directly copied to libraries\joomla\cache\storage folder. 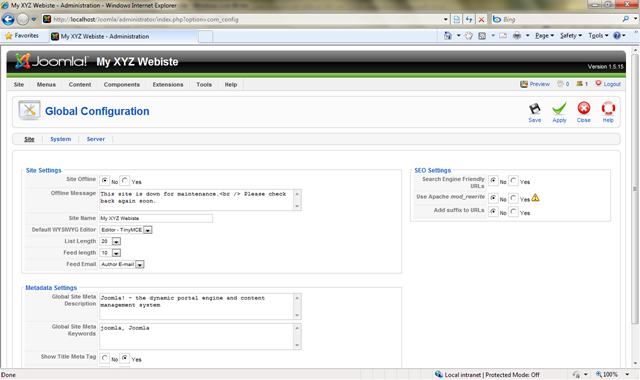 Restart IIS and go to administrator page of Joomla and click on ‘Global Configuration’->’System’. Under ‘Cache Settings’ one can see ‘wincache’ as part of Cache Handler. 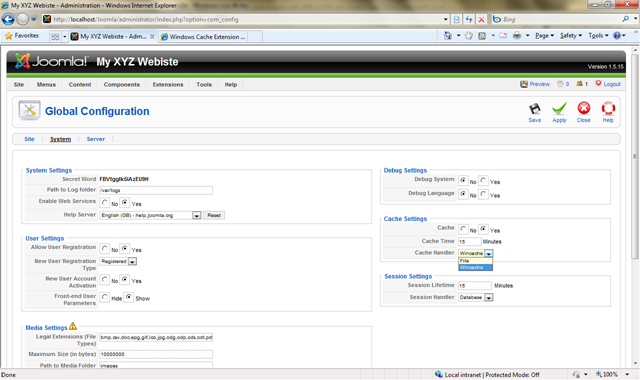 Select it from the drop down list and save the configuration. Pictorial representation below after login to control panel using admin password. Select ‘wincache’ from drop down. Also click on radio button ‘Yes’ for Cache label. Save the settings and restart IIS. In this blog post you learnt how to leverage WINCACHE user cache functionality to enhance performance of Joomla. Hopefully this will be useful to you in running Joomla faster on WINDOWS. Happy caching and till we meet again ‘Good Bye’. Thanks you for the suggestion and taking time in writing comment here. Very much appreciated. I will definitely look at your implementation. To answer your question, WINCACHE does do garbage collection periodically or when certain user cache functions are called. So items which have expired in the cache are removed. 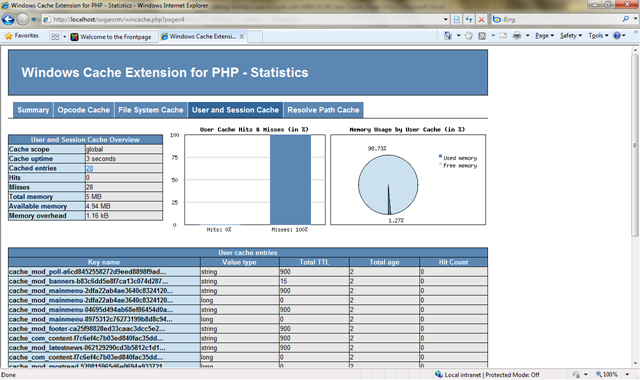 You can see the implementation of it at http://svn.php.net/viewvc/pecl/wincache/trunk/wincache_zvcache.c?view=markup. Look for function named 'run_zvcache_scavenger'. This code is now part of Joomla development branch and will be available in Joomla 1.6 release. The code can be seen at http://joomlacode.org/gf/project/joomla/scmsvn/?action=browse&path=%2Fdevelopment%2Ftrunk%2Flibraries%2Fjoomla%2Fcache%2Fstorage%2F. 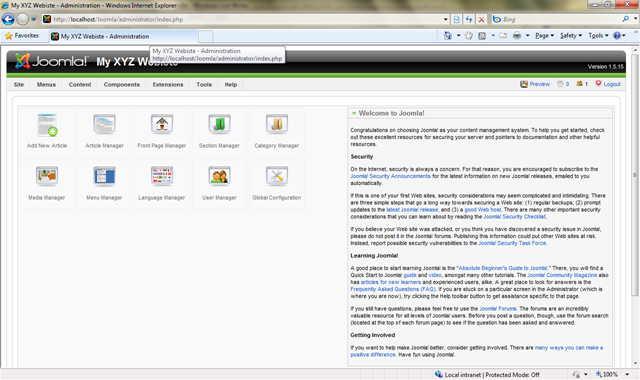 A big thanks to Joomla developers for doing this. Anonynous comments on this blog post are peroidically removed. So you will need to login and post comments so that it is here permanently. Ok, did that, it just seems funny with you answer to unexisting comment.